Veterinary ophthalmologists are specialists with advanced knowledge of ocular health and specialized surgical procedures that are performed on the eye. Veterinary ophthalmologists are veterinarians with advanced training in ocular medicine that allows them to diagnose and treat conditions of the eye including cataracts, corneal ulcers, conjunctivitis, uveitis, and glaucoma. They also provide treatment for traumatic eye injuries. Routine duties for an ophthalmologist in private practice include performing diagnostic tests, pre-surgical exams, surgical procedures, compiling detailed case reports, overseeing veterinary technicians or other support staff, and providing specialty consultations on cases referred to them by general practitioners. Ophthalmology is one of the specialties in which veterinarians can achieve board certification. Veterinary ophthalmologists may choose to specialize in working with one particular species or a category of interest such as large animals, small animals, equines, bovines or exotics. While most veterinary ophthalmologists choose to work in private practice, some are involved in academia or other roles. Veterinary ophthalmologists begin their careers in veterinary school to pursue a Doctor of Veterinary Medicine degree. After becoming licensed, a vet can begin the path of study that will lead to board certification in the specialty field of ophthalmology. This process is not easy and requires hands-on practical exposure to animals as well as serious study and certification. In order to be eligible to sit for the board certification exam, a candidate must meet several significant educational requirements. Candidates must first complete a one-year internship in their related field. After successfully completing the internship, they must then undertake a three-year residency in the field, either at a veterinary teaching hospital or at a clinic working under the supervision of a board certified ophthalmology diplomate. Once the educational requirements have been completed, the vet is eligible to sit for the board certification exam. The exam is administered by the American College of Veterinary Ophthalmologists (ACVO). It consists of written, practical, and surgical elements which are tested over a period of four days. After completing this exam successfully a veterinarian is granted diplomate status in the veterinary specialty of ophthalmology. Diplomates must also complete continuing education credits each year in order to maintain their board-certified status and to keep their knowledge of advances in the field as current as possible. These credits can be earned by attending lectures, participating in wet labs, and going to specialty-related seminars. Working as a veterinary ophthalmologist has high earning potential. Many working in the field command six-figure salaries. However, the education needed to practice can be extremely expensive. Aspiring ophthalmologists do earn a salary while completing their residencies, though the level of compensation is not nearly as much as a veterinarian earns in clinical private practice. Residency salaries generally range from $25,000 to $35,000 per year. The average annual salary for a veterinarian ophthalmologist is $215,120, making this specialty one of the highest paying in the Veterinary industry. The Bureau of Labor Statistics indicates that the veterinary profession as a whole will continue to show strong growth. All veterinarians who achieve board certification should enjoy very strong job prospects in the field. The difficult nature of both specialty training programs and board certification exams ensure that only a small number of professionals are able to achieve board certification each year. 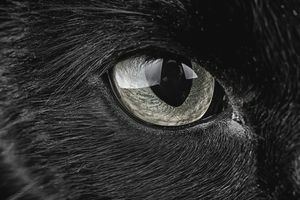 The extremely small number of board-certified professionals in the specialty of veterinary ophthalmology will keep diplomates in high demand for the foreseeable future.